Click chart to see in-depth Nikkei data. If you think U.S. markets had a record-breaking year, check out the Nikkei index in Japan -- and try to avoid drooling. Tokyo's benchmark index surged by 56.7% in 2013 -- its biggest annual rise in over 40 years -- after a series of government initiatives helped boost investor confidence, weaken the yen and encourage economic expansion. While stock market performance in America has been stellar -- with the Dow Jones industrial average and S&P 500 hitting record highs throughout the year -- their gains of 26% and 29%, respectively, still pale in comparison to Japan. What's behind the outsized gains in Japan? Many would point to Japanese Prime Minister Shinzo Abe. Abe is being credited with jolting the world's third largest economy out of stagnation with his ambitious turnaround plan, known as Abenomics, which aims to end years of deflation and lead to robust economic growth. Abe has increased government spending and installed a central banker who is not afraid to use aggressive monetary policy. The moves have helped drive down the value of the Japanese currency, with the yen falling by nearly 18% versus the U.S. dollar. This drop has ultimately given a big boost to stock markets and Japanese companies that rely on exports. There were many winners this year on the Nikkei -- 182 out of the index's 225 companies saw their shares move higher. The biggest gainer was Mazda Motor Corp, (MZDAF) which saw shares surge by nearly 158%. Softbank (SFTBF) shares were not far behind, rising by just over 141%. But Nikon (NINOY) couldn't seem to catch a break, with shares in the multinational camera maker posting the worst performance on the Nikkei, falling by nearly 35%. Other big names on the Nikkei -- Toyota (TM) and Sony (SNE) -- each gained 32% and 57%, respectively. 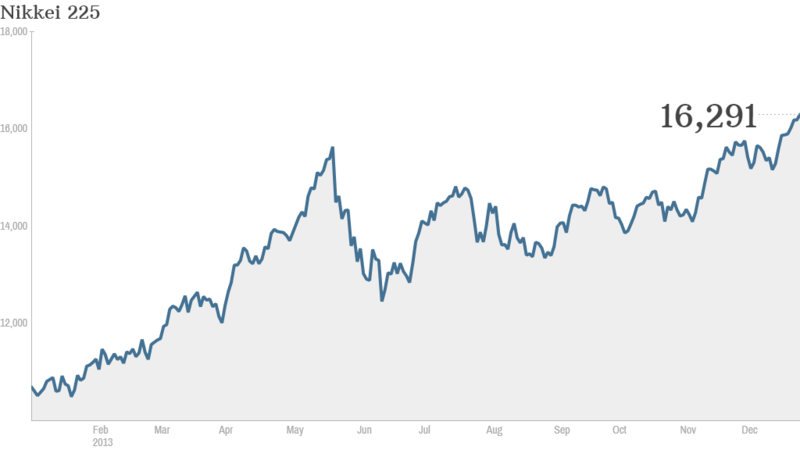 The massive Nikkei rise in 2013 follows its 23% rally in 2012. Prior to that, the most recent Nikkei surge was in 2005, when the index climbed by 40%.